An interesting factor of buying comic books (real comics – not digital), is that their value can fluctuate above or below their original price. Aside from being fun to read, buying real comics can have a side-benefit because they have a resale value. Here’s another look at a comic book from an investment point of view. 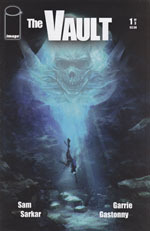 Image Comics published the Vault #1 on July 27, 2011. It was written by Sam Sarkar and illustrated by Garrie Gastonny. This issue was sold on ebay for $9.99 (plus shipping) on March 15, 2012. Now that we’ve looked at the rata data, let’s see why these things matter. Gold – a precious metal that exists in a limited supply. More of it can be (and is) mined every day but it cannot be created. Primarily, it is used to create jewelry but it is also used in electronics. This is because it is an efficient conductor that can remain free of corrosion. Gold is also seen as a storehouse of wealth because it does exist in short supply (in comparison to its demand) and because more cannot be created by man. As the value of the dollar falls, the price of gold rises. When more money is printed, the price of gold rises. And, as faith in the dollar falls, the price of gold will rise. It is viewed by investors as a safe bet against the decline in value of paper currency. DOW – the Dow Jones Industrial Average is an index that compiles the daily stock prices of 30 large, publicly traded U.S. companies. The DOW, relative to its past performance, can indicate how well the stock market is performing. For example, in 2007 (when the American economy was booming), the DOW climbed to a little over $14,000. But, in 2009, when our economy crashed, the DOW fell all the way to $6,626. CPI – The Consumer Price Index measures the price of a basket of goods and services. By comparing it to past performance, we can track inflation. Inflation is the rate at which your paper currency is devalued. In 1983, the CPI was $100; it hit $200 in 2006. That means that it would have cost you twice as much to buy the same basket of goods/services in 2006 than it cost in 1983. So, in nearly twenty years, the value of the U.S. dollar was decreased by half. And, that’s using government-issued numbers (so there’s probably some “funny business” going on – and the inflation rate is actually much higher). (2) need to sell some of your possessions to pay for something else. When making the decision to buy something, I hope you’ll keep in mind that digital items (be they comics, music, movies, etc) retain no resale value. Are you spending your money wisely?